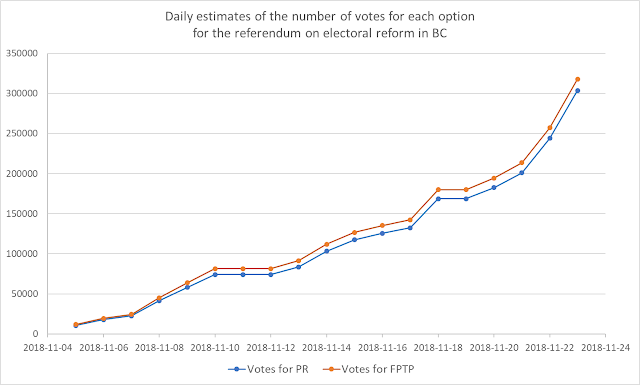 The other day I was reporting that, based on the turnout data by riding provided daily by Elections BC, there were reasons to believe the NO side (i.e: keeping the current FPTP) was ahead. 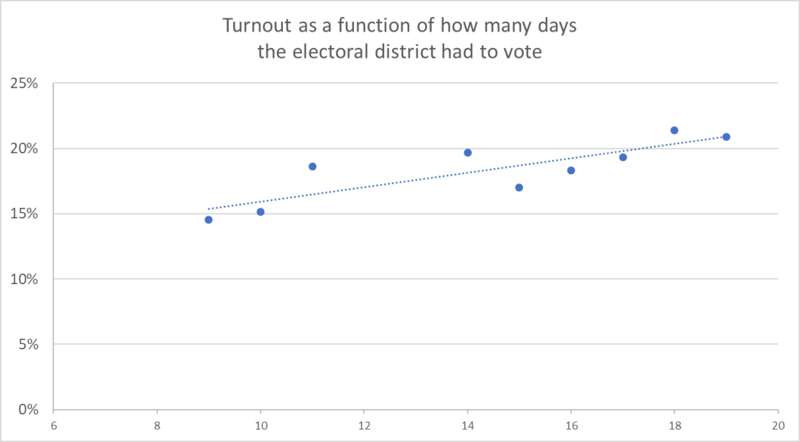 That was mostly because turnout data was indicating that older (55+) people were voting more, as well as higher turnouts in the interior. 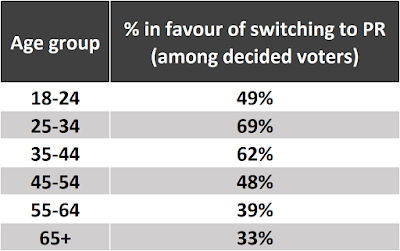 Those two groups are known (by the polls for instance) to be less favourable to PR. 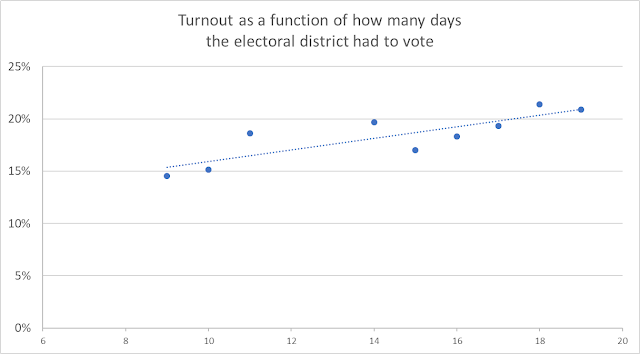 However, the analysis was made difficult because by far the main determinant of the turnout was when the riding received the ballots. I was trying to account for this but nothing is ever perfect. Today I decided to do a different exercise. 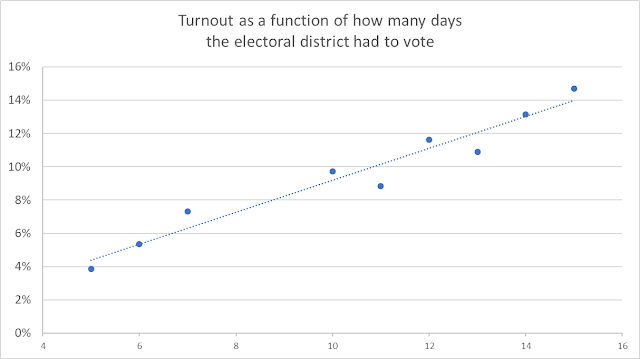 I figured that turnout is nice (i.e: percentage of registered voters actually voting). But what ultimately matters is the number of votes. And we have that information! We also know, thanks to the polls, the average level of support by age and by region. I can therefore use this information and try to estimate how many votes the YES and NO sides have received so far. This is obviously an exercise providing only estimates. The votes have not actually been counted. But I think it can be interesting. The four polls (Angus-Reid, Insight West, Mainstreet and Research Co - I ignored my own Google Survey poll even though the results are completely consistent with the others) all mostly agree: the older you are, the less likely you are to support PR. Also, the Interior of BC is more pro FPTP than the Lower Mainland or the Island. They don't all agree on the actual numbers (it's normal) but overall, they show the same picture. I thus averaged these four polls and used the averages to estimates how many votes have been casted for each side. Without going into too much detail, if a riding in the Interior has already mailed 4000 ballots and this riding has a higher proportion of 55+ than the rest of the province, my estimate will be that a majority of these 4000 votes are for keeping the current system. The exact number of votes for each side will be calculated based on the averages by age and region, as shown below. Here are the averages I used. Millennials and Gen Z are really, really in favour of PR while older Gen X and Baby-Boomers are really against it. Similarly, the rest of BC is really agaist the idea of switching system. Here are the total number of votes (they sum to the total provided by Elections BC, obviously) for each side. Yes it's close. A better way to see who's ahead is to look at the percentages. 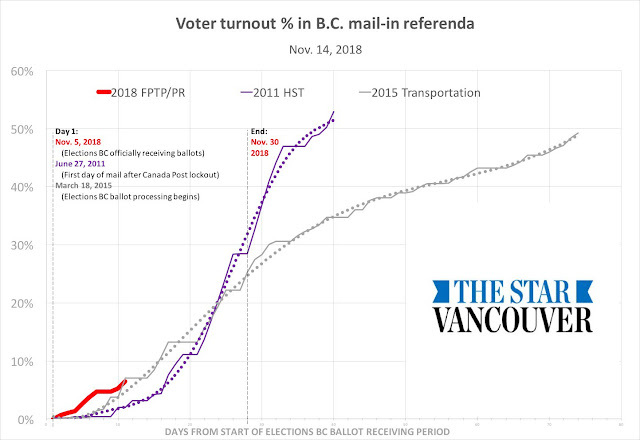 Here you can see that as the Lower Mainland ridings have started sending back their ballots (they got them later), the YES side has progressively climbed back. To the point where it could well be ahead right now. Notice that this entire exercise is only valid to the extend that these polls are right. In particular, it is necessary to assume that the undecided (they are many of them in the polls) won't break in favour of one or the other side. Polls done over the last few weeks all showed the same 50-50 race so it doesn't look like the undecided are choosing one side more than the other so far. Additionally, my estimates below are quite sensitive to the averages used. Adding the Research Co. numbers of yesterday made the NO side ahead at the beginning while it was behind the whole time before. At least no matter what averages I used, the trend has been the same: pro PR. I tried to run these estimates using only the data on age or region. If I only use the age (and thus the age distribution profile in each riding), I would get the YES side at 50.78% as of today. Using only the region, I have the YES at 49.6% and therefore behind. It was at 48.7% at the beginning of the campaign. So, why am I now saying the YES side might be ahead when my previous post was saying otherwise? I think the best explanation is that the regression was showing that indeed older people were voting more. That's still the case if I run the regression today. But the difference isn't big enough to compensate for the 18-44 that are more pro PR. Also, the influence of the Interior is vanishing as we keep counting votes. 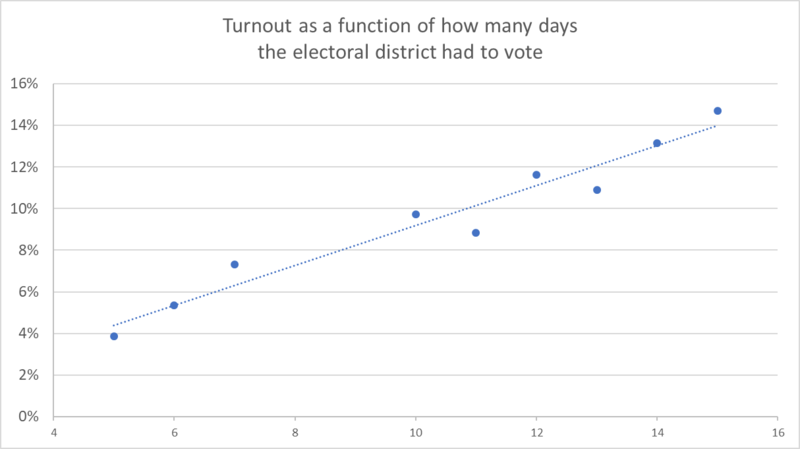 More importantly, it's one thing to show a higher turnout (so a higher %) but ultimately it's the total number of votes that will be counted. The Interior riding might be voting slightly more (note: as of today, my regression isn't showing any significant effect anymore regarding the region) but these ridings don't represent that many votes. 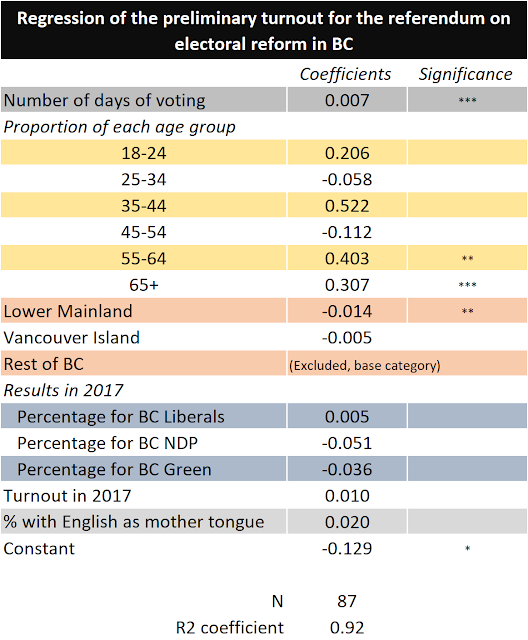 Finally, and this is more stat nerdy stuff, but just because a result is statistically significant doesn't mean it's important in magnitude (it was a difference of less than 2% for the turnout in the Lower Mainland versus the Interior). In our situation, the difference in turnout by age (and therefore the bigger influence of the 55+) might not have that much of an impact. Still, I think the conclusion remains that it's super close. 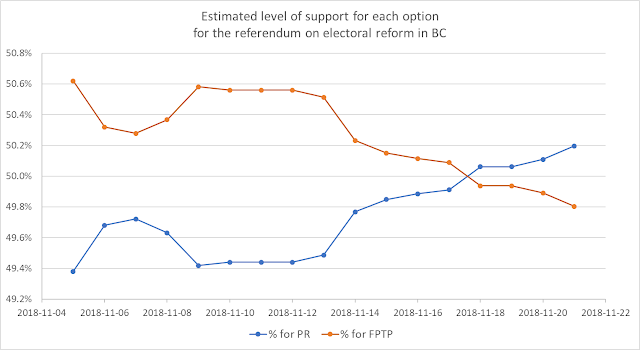 The trend is good for the PR side and we still have many ridings that should provide many votes for a change that have a low turnout (the Victoria ridings for instance, some of the rare ridings that said YES in 2009). But similar to what the polls have been showing, this is a very close contest. The one thing that I still observe in my regressions is that ridings that voted more for the NDP in 2017 are not voting as much as others so far. 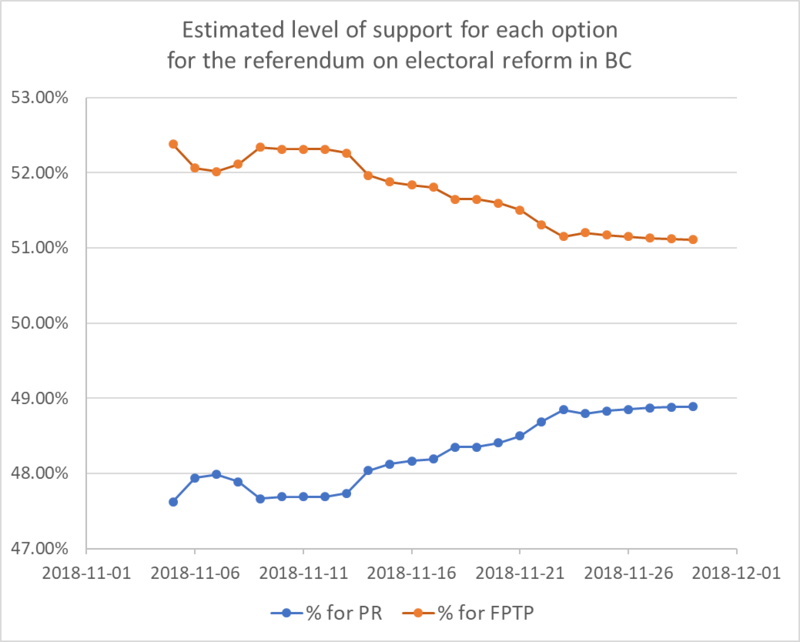 If Horgan and the NDP are serious about wanting PR, they should be able to get the vote out in their own ridings. I'll update this graph regularly (I don't promise to do it daily!). 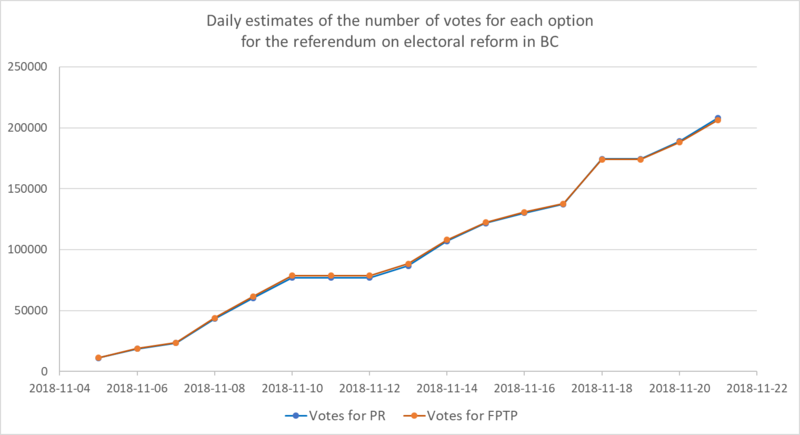 The referendum on electoral reform is happening right now in BC. According to Elections BC, as of yesterday's morning, 6.5% of the registered voters have sent their ballots back (or, more exactly, Elections BC had received these ballots). With every single poll showing pretty much a 50-50 race, including my own poll, turnout might be the key to this referendum. Which side will get its vote out the most? If Millennials and people on the Island vote the most, PR will pass. If, on the other hand, the votes come mostly from older people living in the interior, then the current system will prevail. It's very early and therefore preliminary, but let's look at the numbers and see if we can find some patterns. As mentioned above, the current turnout is 6.5% but there is considerable variation across ridings. This is mostly due to the fact that some regions (mostly in the interior of BC) got their envelops earlier. According to the website of Elections BC, there are four groups: 1 that received by October 24th, another by the 25, one by the 26 and, more importantly, a large group of 64 ridings that received their ballots until November 2nd. Among this group, you have variations as well (as indicated by the fact that some of these ridings were below 1% turnout even yesterday) but we don't have the exact date. For us, it creates really two groups: the 23 ridings (16 in the interior, 4 in the Lower Mainland and 3 on the Island) that received early and the rest. It is important to keep that in mind during our analysis. Elections BC started reporting on the number of ballots received on November 5th. For the first group of ridings, that means up to 12 days after receiving the envelops while the second group could have had as little as 3 days. We naturally expect the current turnout in the first group to be higher and it is. 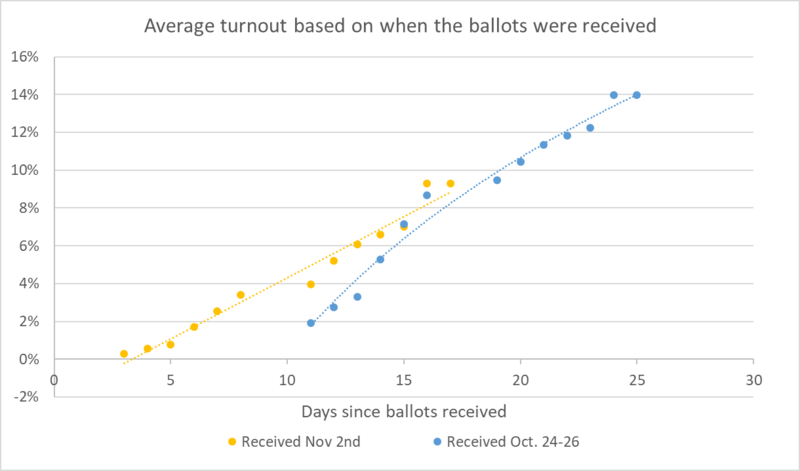 The average (not weighted, so each riding is equal) turnout is around 10.5% while it's only around 5% for the second group (another way to see the impact of the dates, the first group represents 36% of all ballots received while representing only 26% of the ridings). As you can see the second group is catching up. 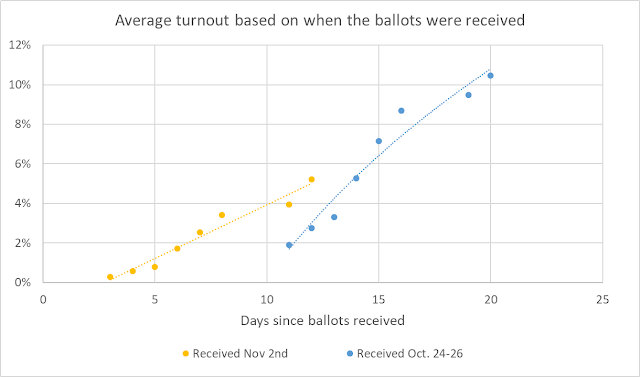 As a matter of fact, at the same numbers of days since receiving the ballots, the second group is higher. But remember that the second group has more variety within it and not all ridings actually received their ballots as late as November 2nd. Also, comparing the number of days since received isn't truly an apple to apple comparison. According to Google Trends, the interest in this referendum picked up early November and peaked at the "lit" debate on November 7th (see graph below). This means that it's reasonable to assume the second group of ridings would have voted sooner while the first group wanted to wait. They should converge as we approach the deadline. So, where is this heading? As some people right in fearing a record low turnout? Maybe. Using this graph from David P. Ball from the Star, we see that the early turnout for this referendum is actually outpacing the previous two referendums (the 2011 one about the HST and the 2015 transit "plebiscite"). So, can we expect this referendum to break the 50% barrier? I'm skeptical. 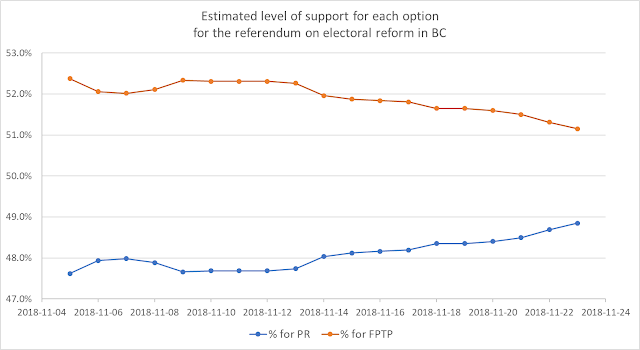 I believe more people were interested in the HST (people actually requested this referendum after being upset at the BC Liberals for breaking their promise not to introduce this tax; Plus, you know, people really, really dislike sale taxes) or the transit plan than electoral reform. The Angus-Reid poll was clearly showing that for many people, this just wasn't a major topic. Also, if I only use the data from the first group (the one that got their ballots earlier), we see that the best fit for the data seems to be a concave function (like a logarithm). 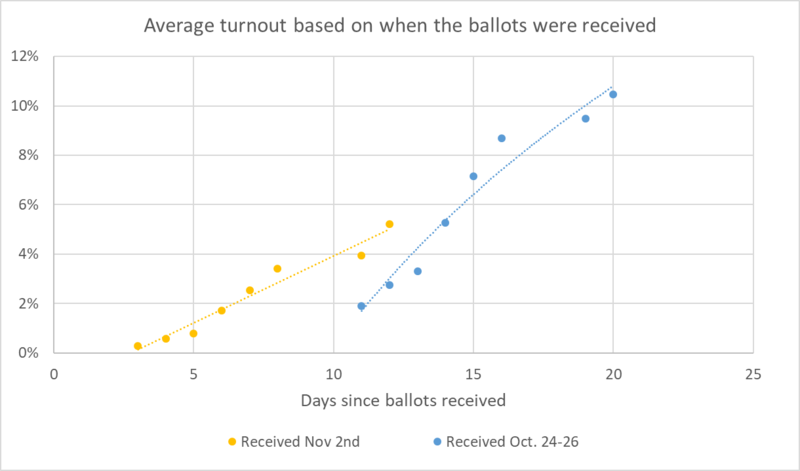 The HST line on the graph above showed that turnout really picked up after around 16 days. If the same was to happen this year, the current data isn't showing this. But again, this is very early. Let's do the extrapolation with multiple scenarios. Scenario 1: we extrapolate the current concave function. In this case, we would predict a final turnout of around 20%. Scenario 2: linear extrapolation. In this case, we end up at around 26%. Scenario 3: it picks up. In this case, your guess is as good as mine. I can't really use the current data since it doesn't show an steepening of the slope. Based on the graph from the Star, 50% and more isn't impossible. 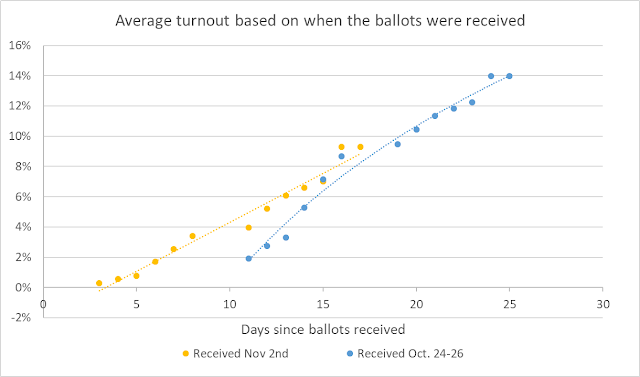 Maybe a better way is to see where the HST turnout was at the same point as when this referendum will end. As you can see, this is just crossing the 30% mark. Ultimately a turnout between 20 and 30% seems likely. Not only based on these graph but on the fact that during a similar referendum last year, Prince Edward Island got 36% turnout. If you account for the fact that PEI has higher general turnouts than BC, then 20-30% becomes quite good actually. Again, I repeat myself but this is very early and the data is not super reliable for now (the problem really is the second group of ridings that just started voting). 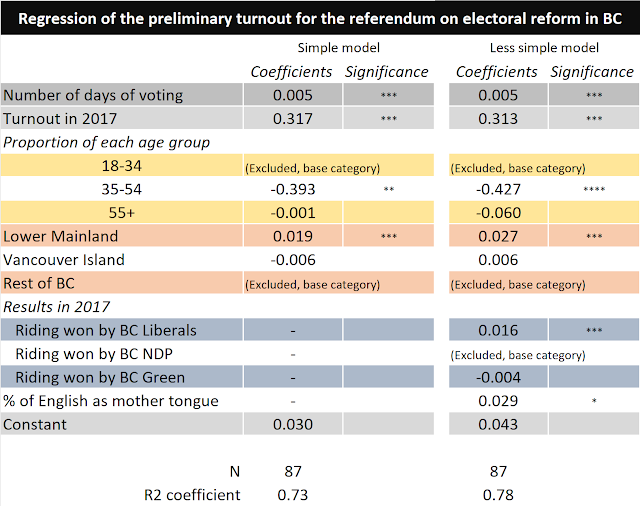 Still, I decided to look at general correlations between the current turnout and some other variables such as the region, the electoral results in 2017 (is the riding a Liberal or NDP one?) as well as the median age and the share of Millennials in the riding (based on the 2011 census, haven't seen the updated version unfortunately). What did I find? So far, it seems the Interior is voting more (and that's while factoring the fact most of the ridings in the first group were from this region; I used a regression to isolate each effect). For the age and shares of Millennials, they both have positive effects on the turnout! Is it possible that young people are voting (the 18-44, so that includes some Gen Z) and the older people also do? So a Baby-boomers versus Millennials while the Gen X would watch from the sideline. 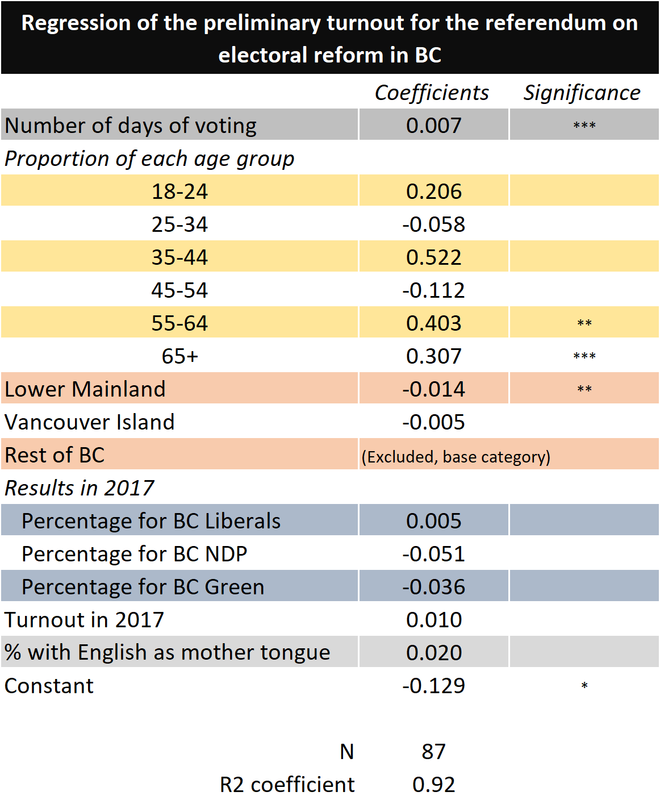 Finally, regarding who the riding voted for in 2017, I find that BC Liberals ridings are currently voting more (again, this is while accounting for when they received their ballots). All of this is consistent with the Insight West poll showing that among the people who had voted already, FPTP was leading. Yes my regression is supposed to control for the fact some ridings received their ballots sooner, but it might not be doing a perfect job yet since we are too early in the process. 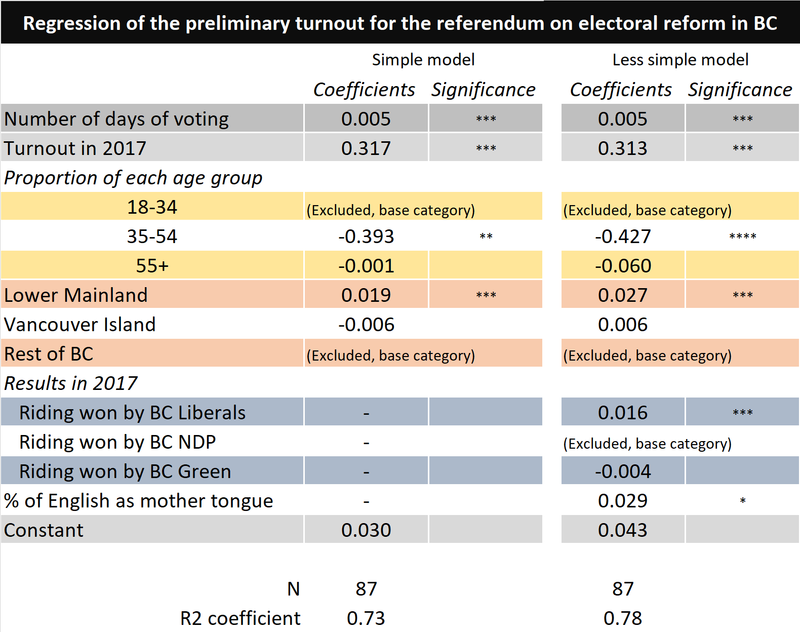 Or turnout will simply remain higher among the BC Liberals, older ridings in the interior and proportional representation won't pass. So right now it doesn't look too good for proportional representation. But we'll. My poll was clearly showing that the undecided were more similar to the pro-PR folks. The key now for Horgan and Weaver is to get these people (mostly Millennials) to actually vote. As a conclusion, I think the key might be how well the Green party is mobilizing its voters. They are around 18% right now in the polls (so similar to last year). Their partisans are some of the most pro-PR, for obvious reasons. If the overall turnout does remain as low as 20%, then the Green vote could well be the difference. If this party can get its voters to vote, even half of them, that could be enough to reach a majority in favor of PR. The Liberals are definitely trying hard to get their vote out and I'm not sure about the NDP. Just a few days after I published my own poll (conducted using Google Survey) on the referendum on electoral reform in BC, we now have a new Mainstreet poll. And it's showing exactly the same results! Before talking about this poll, how remarkable is that? A $200 poll conducted using Google Survey can do just as good of a job as a full fledged, regular poll! You might not be excited about it but the political nerd/statistical geek in me is super excited. This is potentially revolutionary. Polling cost have already come down a lot in the last decade thanks to IVR and online sample, but Google Survey is just dirt cheap. So, anyway, the new Mainstreet poll puts the "keeping the current system" at 50.5% among decided voter while "proportional representation" would receive 49.5%. My own poll had 50.25% for keeping the current system (Note: yes when I published on Tuesday, "switching to PR" was slightly ahead -at 50.1%- but that's because I wanted to publish even though I still needed around 20 observations to be collected. Google Survey is great but it's crazy slow for the last few observations. It took almost a day and a half to collect these last 20 observations. When it was done, "keeping the current system" was back on top. It's irrelevant ultimately, with margins of error this was and is a 50-50 race). The debate tonight between Horgan (NDP Premier of BC and pro-PR) and the Liberal leader Andrew Wilkinson (deeply against PR, as is most of the BC Liberals) will be interesting and incredibly important. Proportional representation was ahead in every poll done before this referendum. So Horgan and his partner, Green leader Andrew Weaver, are currently losing this campaign it seems. Turnout so far has been... abysmal! Only 1.4% of registered voters have returned their mail-in ballot. Of course not everybody got their ballots at the same time and the postal strike doesn't help. Still, I wouldn't be surprised if the overall turnout, at the end, doesn't go above 30%. It'll ultimately come down to turnout and undecided. Unfortunately Mainstreet doesn't indicate how many people are undecided. I'll ask them. [ Update: I asked and they didn't offer an undecided option at all; This goes a little bit against what I had seen before where the question without undecided would be more pro-PR than the question with the option]. The poll also confirms what my own poll was showing: people under 35 are the biggest supporters of proportional representation. The Mainstreet poll also confirms what is common sense: if we switch to PR, Multi-Member proportional is the preferred system. Maybe surprisingly, the never used before Dual member proportional is third while the weird urban-rural proportional is second. I would have expected the opposite. Full disclosure: I voted to switch to proportional representation. I have never hidden the fact I was pro-PR even if adopting PR pretty much puts me out of a job since projections wouldn't be as important anymore. Just because I have an opinion on this topic doesn't mean I can't be impartial when doing an analysis. According to a poll conducted exclusively for this blog by Google Survey, British Colombians are almost perfectly divided on the electoral reform referendum. An important share of the population is however undecided and could ultimately make the difference. 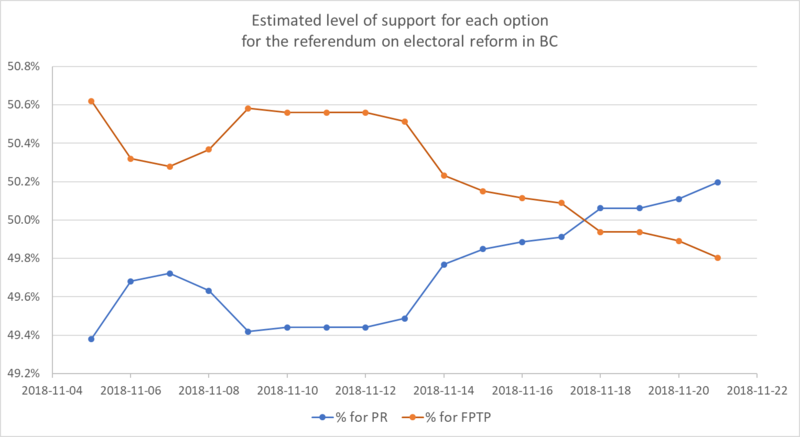 Even though we are in the middle of the referendum period (many people, including myself, have already returned their mail-in ballot) and the debate between the NDP-Premier John Horgan and Liberal leader Andrew Wilkinson is this Thursday, we've had almost no poll. The only one is from over a month ago! So I decided to spend some of that Google ads money my site generated during the Quebec election and to order a poll from Google Survey (I guess Google is winning at the end). I had already tried for the Ontario election with good results (especially in hindsight since most polls underestimated the PC and overestimated the NDP, although my poll was done a little bit far from the election date, so I might have been lucky). I also ordered a "fun" poll asking people what they thought of Maxime Bernier's infamous tweet. Google Survey has also been used in the US with great success for electoral polling. Google Survey uses the usual Google database (usually used for marketing purposes) to create a representative sample of the Canadian population. They are fairly cheap (20 cents per answer as long as you only ask one question; It increases to $1 and more if you want multiple questions). This poll was done from October 31st to November 6th (so right after the peak in interest for this referendum, thus when people would likely start voting; They have until the end of the month to do so). The sample size is 1200 respondents, although the final number of observations is just over 800 because many respondents didn't have an age and/or gender and were therefore dropped (given a weight of zero). The specific question I asked was "There is currently a referendum on electoral reform in BC. You have or will receive your voting package in the mail. Which following option do you intend to vote for?". I only asked this one question and didn't try to replicate the format of the referendum where a second question exists (you have to choose between 3 potential proportional systems). I did it for monetary reasons and because, quite frankly, the main question is whether BC will switch or not. No actual margins of error since the poll is online but a probabilistic sample of that size would have margins of 3.4% 19 times out of 20. First observation: it's close! So, so close. Among decided voters, it's essentially a 50-50 race. And it has been like that all along the period during which the data was collected. "Keeping the current system" was actually ahead for the most part until the last 50 observations. This referendum doesn't have a qualified majority threshold, so 50%+1 would be enough. Notice however the very high number of people who are undecided. I wish I had the budget to ask them a leaning question but I didn't. I'm not surprised by the high number though. Electoral reform can be seen as a complex issue, or one that doesn't matter. It also seems that online polls, and Google Surveys in particular, have a higher share of undecided. It's interesting to see more people being undecided on this topic than regarding Bernier's tweet! Let's compare these numbers to the Angus-Reid poll of September. 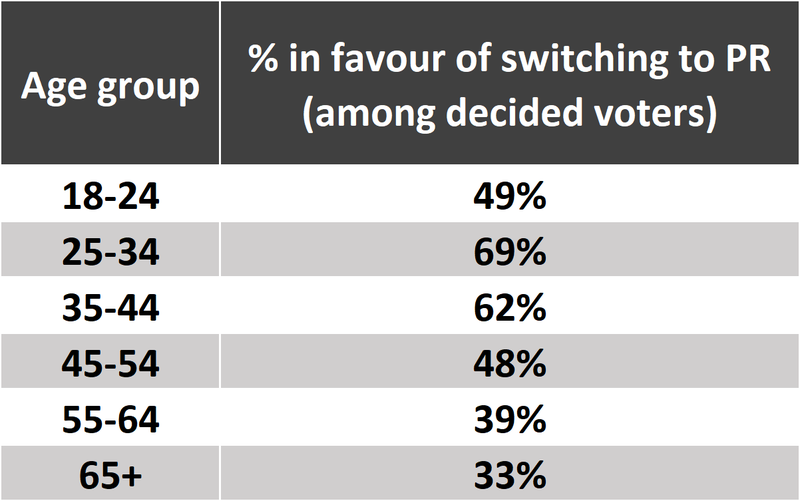 At that time, 33% were undecided, 31% in favour of keeping the current system and 33% wanted to switch. This meant that among decided voters, it was 52-48. My poll numbers match pretty well (not withstanding the higher number of undecided). Can we take it as evidence of a negative trend against proportional representation? Not really since once you apply the margins of error, both polls pretty much match. With that said, we had seen a trend over the last year according to Angus-Reid. I mentioned it in my post about that poll. It's not clear if Horgan and Weaver are currently losing their referendum or if it's more a question of allowing a "not sure/Don't know" option in the poll. It is possible that pro-PR people are simply less sure of their choices than anti-PR ones. So the 40%+ of undecided in this poll might actually break slightly in favour of switching (note: I expect most of them not to vote at all). The Tyee wrote about comparing different polls with different methodologies already. Still, I think it's fair to say that this referendum could be very close and I'm not sure the YES campaign is winning so far. Fear mongering arguments (proportional representation will literally allow a nazi party to have seats!...) and others, more valid arguments (the systems offered are half defined, in particular MMP where they haven't even chosen what kind of lists we'd use!) can easily convince some voters against taking the risk to switch. 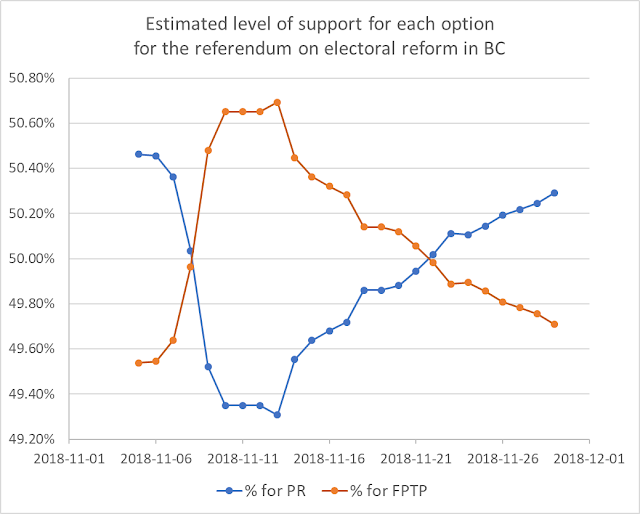 If Horgan is serious in his desire to adopt proportional representation, he'll need to give a convincing performance on Thursday. I'd suggest to maybe emphasize more on the fact that we'd vote again after 2 elections to confirm we want to keep PR. Also, I maintain my position that this referendum would be an easier sell if we could all agree that only MMP is a viable option (Dual member proportional is a system never applied anywhere, invented by a student in mathematics in Alberta and is, ultimately, just a modified version of MMP with more complex features such as vote transfers and forfeited seats; Urban-Rural proportional is too complicated -it mixes STV and MMP- and I can't see it winning). Doing so could clarify the choice for people. Just my 5 cents of course. It seems to be Millennials vs Baby boomers (and older Gen X). The general trend isn't surprising but the extend of the difference between age groups might be bigger than expected. Millennials and later Gen X really, really support proportional representation while older Gen X and Baby Boomers, really don't. The 18-24 is a little bit surprising and might be due to an overall small sample size (or way too many undecided, see below). Finally, if I look at the age profile of the undecided, I find that they are younger than the population in general. For instance, over 25% of the undecided are between 18-24 while they only represent 20% of the total sample. On the other hand, only 5% of the undecided are aged 65 and over (versus over 8% of the sample coming from this age group). Here is the percentage of undecided by age. 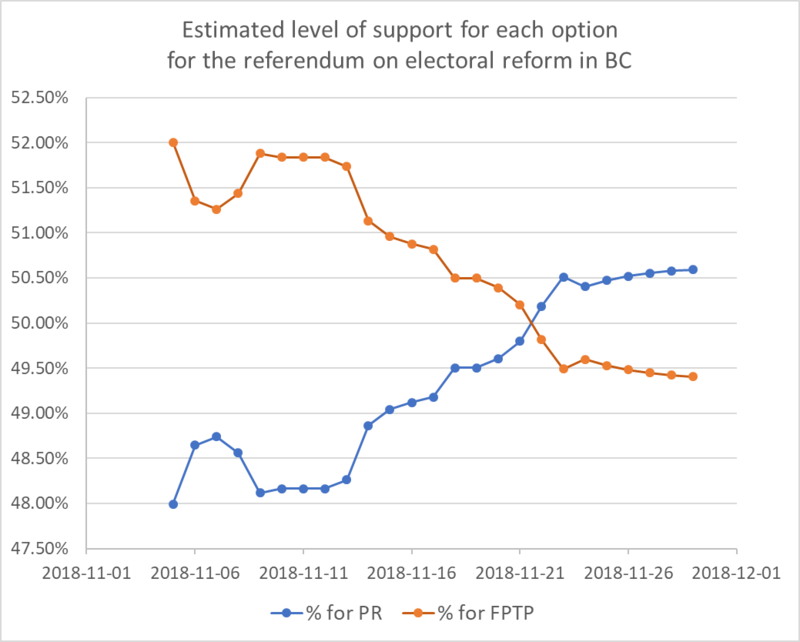 The fact the undecided are mostly in the age groups that are otherwise favourable to proportional representation is potentially good news for John Horgan and Andrew Weaver. But it also means they need to make sure to convince them to vote ultimately. Turnout will likely be very low (Prince Edward Island got 36% during a similar mail-in referendum last year but this province is used to turnouts much higher than in BC). So every vote could be very important. Now let's wait and see if the debate this Thursday will change this referendum. It'd also be interesting to reweigh the data based on the age distribution of BC voters as opposed to the census. But that will be for another day for me. If you'd like to have access to the raw polling data, email me your request along with the reason 9and who you are! ).